Awful play by Marian Gaborik poking this puck by the best goalie in the league. Believe me….he had the situation under control. Neal just turns and fires; Roloson wasn’t even ready for this one. Pittsburgh is winning games exactly the same way they were after Crosby went down, boring, shutdown hockey. Please come back, Tampa Bay. I love two things about this video. A) that it has already been posted on YouTube. B) It was definitely posted by a Wings’ fan because it is titled “Cleary scores an amazing goal of the pad of Bryzgalov”. Planned, yes. Amazing…c’mon. With the Rangers`3-0 loss to Atlanta tonight, they have left themselves extremely vulnerable to being overtaken by Carolina this weekend. If Carolina wins out against Atlanta and Tampa Bay this weekend, they will surpass the Rangers because they own the head to head tiebreaker against them. So technically, the Rangers could still beat New Jersey on Saturday and still miss the playoffs by a hair for the second year in row. Buffalo just needs to win one of their final games to clinch a spot this year; shouldn`t be an issue as they face Columbus in their last game of the year. A lot will be made more clear tomorrow after both Buffalo and Carolina play their 81st game. With a rare quiet Thursday night in the NHL, here is a look at what things could look like come Friday morning in the playoff races. – A Montreal win combined with a Rangers’ loss confirms that Montreal will either finish 6th or 7th in the Conference. – A Rangers’ win means that they could still finish anywhere between 6th and 8th, but since Carolina has the tiebreaker with them, could still finish out of the playoffs. – A Dallas overtime loss would clinch a playoff spot for Nashville and Phoenix. – A Dallas regulation loss would clinch a playoff spot for the two above, as well as Anaheim and Chicago, because although Dallas would still only be four points back with two games remaining, they would not be able to catch their 45 and 43 wins. Thankfully, they play the Avs. 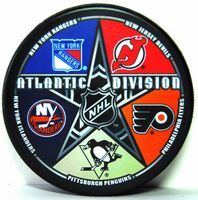 Here we go with another awesome puck picture and my picks for breakouts in the tough Atlantic. There is a report today that Nikolai Zherdev has told his agent that it is more likely he would sign in the NHL than back in the KHL. In the two seasons before jumping ship, Zherdev had 61 and 58 points for Columbus and the Rangers. He made $3.25 million in his season in the League, so I don’t expect him to get even above $3 million, especially since he only had 39 points in 52 games for Mytishchi Atlant. In comparison to other recent defectors, Hudler had 54 points in 54 games and Alexander Radulov had 63 in 53, along with winning the Golden Stick Award for MVP of the KHL. If Zherdev is willing to knock his price down for a one year deal somewhere (which is all I think teams should be willing to sign him to) then I think he is going to be a very valuable commodity this offseason. Take a look down the list of team’s that can use a scoring winger right now; off the top of my head I could see him in Toronto, Calgary, Boston and I’m sure the Rangers will get involved again. They seem to have a knack for signing Europeans that don’t produce. Mike Richards had one (empty net) goal in the eight games that Jeff Carter was out of the lineup; he has two tonight in Carter’s return. The see-saw game of the night was 3-3, but Gaborik just gave the Rangers the lead with a flip shot over Boucher’s shoulder.